Here's our secret sauce. We run advertising all over the web. Those prospects who raise their hand asking for more information regarding "starting a home business" get an SMS message verifying their interest. These "Home Business" prospects confirm their interest by taking an extra step and confirming through that SMS - double opting in for more information. You ONLY receive prospects that are 100% mobile friendly, which means you can communicate directly with them and they've approved SMS communications. Of course all the prospect information is delivered to you LIVE or in real-time! Each prospect who responds must confirm their interest through clicking on a link they find on their personal mobile device. Our goal is to confirm this prospect's identity & interest, so we're assured that YOU are hearing from 'real' people/prospects. This helps us deliver 100% mobile friendly prospects to you. Prospects have watched all or part of a 5-minute video on our newest "HomeBizAdvisors" ad page (which can be found by clicking the image above and to the right). ONLY after confirming thru SMS messaging will the prospect be redirected to YOUR PERSONAL website or marketing video/funnel. You provide this to us when completing your order. LAST BUT NOT LEAST - If you check the option upon checking out, we will send an introduction SMS message to all your prospects as they respond. In the SMS message we will introduce them to you as the "Business Owner" ready to help them find the right home business to start. We provide the prospect with your name, your email, your phone number and even include your personal website in case they leave your site and decide they'd like to return. ATTENTION NOTE: This "Introduction" feature is ONLY offered on the "Exclusive" Redirect Lead Product (not offered on Shared). This is HIGH Touch-HIGH Tech coming together in our BREAKTHROUGH Redirect product. 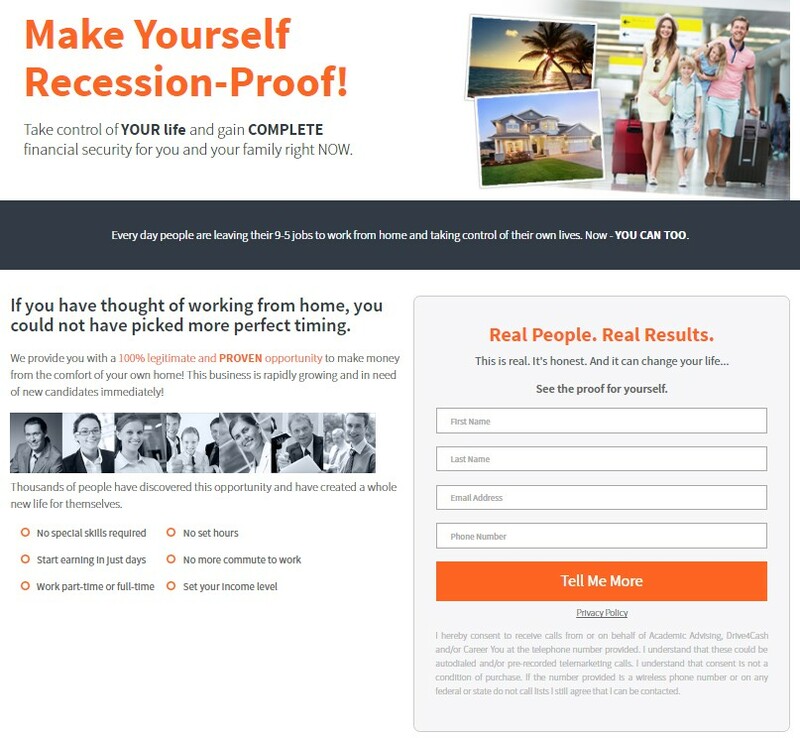 "I sold 4 memberships and recruited 3 new associates personally. Also, seeing how recruiting is a process and not an event, I may end up getting more down the road and there is no way of predicting additional results, but they were the best leads I've worked over the last 15 years. You have done it again! Thank you again!" ~ M.D., Atlanta, GA. Step 2: What is the Maximum # of Leads per day that you would like to receive? 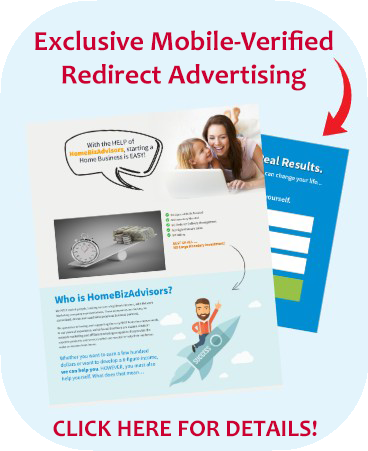 The maximum number of Exclusive Mobile-Verified Redirect Leads that you can request per day is 20. In addition to our web based interface, you have the following options for receiving your Leads.Please check the boxes next to your preferred method of delivery. More than one method of delivery may be selected. * Please note: Successful delivery of SMS Messages can not be guaranteed. Everytime a lead is acquired its contents are emailed to you. Please note: Delivery via email is NOT guaranteed. Check your account daily for new leads. If you choose to set text delivery times, those times DO NOT limit when leads may be generated and delivered to you. It ONLY limits the notification service provided. If you want text messages at all hours, do NOT select the Set Text Delivery Times. Prospects will be sent to a website of your choice. We are not responsible for typos please enter your website address carefully. IMPORTANT REMINDER: Each prospect you receive has already filled out our lead capture page - Example Here! We advise against redirecting your prospects to another lead capture page as it will create redundancy for the prospect. Instead, please ENTER a direct link to your business opportunity presentation, video or website below. I confirm this is the website I want to send my clicks to.